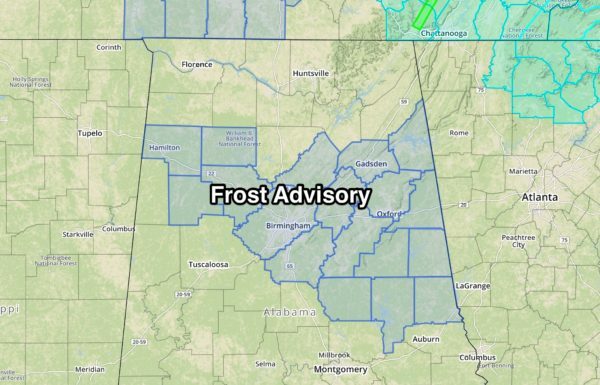 Understand some patchy frost is possible south of the frost advisory as well. Most places will see a low between 34 and 40 degrees; traditionally colder spots will have a touch of touching the freezing mark. The sky will be clear, and the wind will be light. REST OF THE WEEK: Tomorrow will be a sunny day with a nice warm-up; the high will be low to mid 70s. Then, on Wednesday, we warm into the upper 70s with a partly sunny sky. We will mention a small risk of a shower late Wednesday due to an approaching cold front, but moisture will be very limited and most places will stay dry. Then, Thursday and Friday will be cool and dry with a sunny sky both days… afternoon highs will be in the upper 60s and low 70s. For growers, understand Friday morning will be pretty cold. Most communities will see a low around 40 degrees, but colder spots could dip into the 30s again, and some scattered light frost is not out of the question. 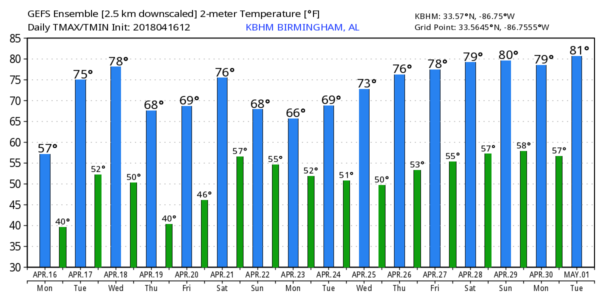 THE ALABAMA WEEKEND: Saturday looks very nice… with a sunny sky we rise into the mid 70s. Clouds return Saturday night, and Sunday looks pretty wet with periods of rain and possibly a few thunderstorms. Both global models are suggesting the surface low will pass through Central or South Alabama, which means little if any chance of severe storms for the northern half of the state. But, it is very early in the week and this could change; stay tuned. NEXT WEEK: Lingering showers are possible Monday, then the rest of the week looks generally dry and pleasant. See the Weather Xtreme video for maps, graphics, and more details.